﻿Despite being behind bars, or perhaps because of those very same bars, 30 women incarcerated at Lee Arrendale State Prison for Women graduated in February with a Certificate in Theology from the Atlanta Theological Association, thanks in large part to Candler faculty, students, staff, and alumni. "Through this program, and the strength it has given me to ask, to look, and to try, I have found that in this darkness, the light of God within me is a light that will not go out," said Arrendale student Carla Simmons during her graduation address. More than a dozen people from the Candler community help make the Certificate in Theological Studies (CTS) program possible at Arrendale each year. Candler students serve as teachers, while faculty from Candler and other Atlanta seminaries oversee the coursework. Dr. Elizabeth Bounds, Candler associate professor of Christian Ethics, co-founded the program in 2009 with alumna Susan Bishop, chaplain at the prison. Adjunct Candler faculty member Cathy Zappa, also an alumna, serves as program director. Learn more about the CTS program. David Ranzolin, a second-year MTS student who taught at Arrendale, says the experience was transformative for his students, but also himself. "I received a necessary corrective to my own pigeonholed notion of who the people in our prisons really are, and my time with them really exposed the things I take for granted and my own self-centeredness." 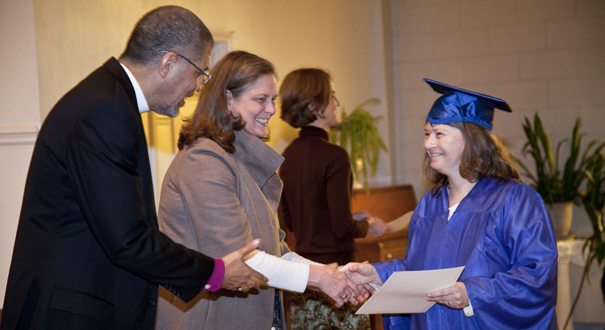 During the program's three years, 12 Candler students and 10 Emory graduate students in religion have helped 51 incarcerated women earn their certificates.